McDonald Real Estate Professionals, Inc.
Close to everything, yet away from it all. 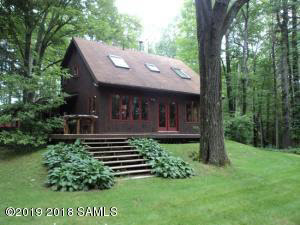 Cozy, private, well cared for 3bed/2 ba Contemporary with an Adirondack flair. On five wooded acres in town of Queensbury with desirable Lake George schools and lower taxes. Cozy wood stove in great room, granite counters and breakfast bar in kitchen. Relaxing hot tub, porch swing and sauna hut. Enjoy nature's beauty while living in a convenient location.Detached 2+Car garage with workshop and storage. Selling Office: Coldwell Banker Prime Properties Inc.